WONJU -- There is no rest for the weary, as PGA Tour golfer Bae Sang-moon vowed on Wednesday to get to work right away after his discharge from the South Korean Army. 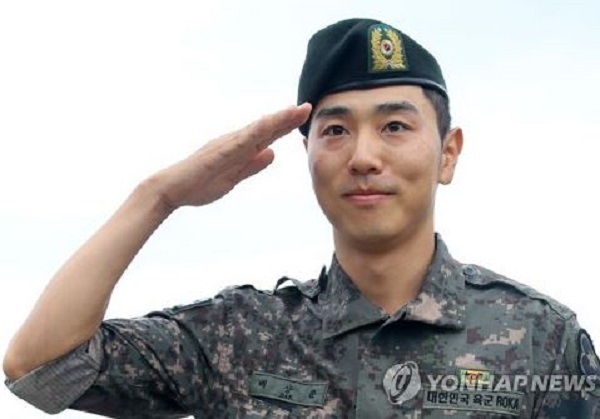 Bae completed his 21-month, mandatory military service here in Wonju, some 130 kilometers east of Seoul, and said he'll hit the range later in the day. Bae, 31, is scheduled to make his return to competitive golf at Shinhan Donghae Open on the Korean Tour on Sept. 14. Prior to his discharge, Bae had said earlier this month he'd done plenty of running and weightlifting to improve his conditioning while in the military, and said he'd grown stronger mentally and physically while in uniform. Bae said he was "confident" that he'd hit the ground running once he returns to action. "I have a lot of work to do," Bae told reporters. "I've been dying to play golf. I want to get some practice in and get into tournament golf. I've been dreaming of the moment when I find myself in contention for a title." Bae said he played a few rounds when he was out on leave. Though he shot some under-par rounds, Bae admitted those rounds were played in far different settings than typical tournament golf -- with the courses less challenging and the atmosphere less stressful. "I am driving the ball farther than before, and I am not worried about my tee shots or my conditioning," Bae added. "I still have time to work on my game, and I think I'll be able to become an even better player." Bae said he has shed a few pounds while in service, and he hopes to put on some weight and add some strength. "I think I must have lost some feel for my chipping, putting and bunker shots," he said. "The key is to get that feel back as soon as possible." Bae added he'll head straight to a driving range after lunch Wednesday. "From today and until the start of the tournament (Shinhan Donghae Open), I can't afford to be doing anything else (but practice)," he said. Bae began his military service -- mandatory for healthy South Korean men between ages 18 and 35 -- in November 2015 amid much controversy. Earlier that year, Bae lost a legal battle against the local military manpower agency over the extension of his overseas travel permit. Bae wanted to extend his visa, which had expired at the end of 2014, so that he could continue playing in the United States. Reflecting on his time in the armed forces, Bae, a rifleman in an Army infantry unit, said he is glad to have served the country. "I've learned the value of perseverance each and every day, and I think this will form a great foundation for the rest of my life," he said. "I believe patience and perseverance will pay huge dividends in my golf career, too."